Lots of East Villagers might be bummed by the absence of the Jets in Sunday’s game. But we shouldn’t lose our sportsmanship or our spirit. There are still plenty of opportunities to enjoy the most important NFL game of the year. But selecting a supreme post to watch the Pittsburgh Steelers take on the Green Bay Packers is no easy feat with all of the East Village options. Not everyone is into amped up Super Bowl crowds, rasslin’ for prime TV viewing real estate. So, do you prefer seats or standing room only? Food or just drinks? Essential questions we at The Local hope to answer in this grouping of neighborhood hot spots. Claire Glass Professor Thom’s, 219 Second Avenue. 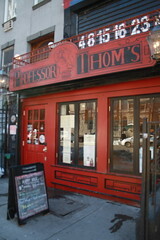 For the true sports bar seeker try Professor Thom’s on 2nd Avenue between 13th and 14th Streets. Here, you’ll find ample space for sitting and standing all in eyeshot of their 17 TVs virtually wallpapering the entire place. To boot, Thom’s will be showing the game on a more than 60-inch projection screen in the back of the bar. This is no place for the faint of heart. Thom’s is a New England Patriots bar, known for attracting truly impassioned fans. The bar tender said Sunday will most likely draw a mixed crowd of fans, but will likely be just as action packed. They offer a full bar menu, but the nachos are your best bet here for game time snacking.